If you’ve followed me for a while now you know that I tend to tell it like it is in “Bedrock Dreams.” I figure I owe it to those budding or novice placer miners out there as well as my loyal readers who have come to expect a straightforward, no-BS approach from me when it comes to all things mining. Anyhoo, as I’ve stated time and time again in this blog, small-scale mining (hard rock or placer) is very hard work even on the best of ground. More importantly, mining is an extremely tough way to try and get rich….hell why beat around the bush here? It’s nearly impossible. This fact is nothing new. All we need to do to verify it is to look back in history to the California Gold Rush . Even though they were swinging picks and shovels over virgin ground where staggering amounts of placer gold had accumulated over millions of years, most ‘49ers (and those that followed hard on their heels) came up short. 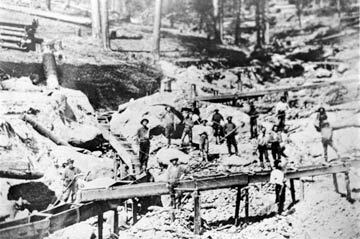 Did you know that the great majority of those hapless souls “rushing” California had little if any experience with gold mining, mining processes, deposition physics, stream hydrology, gold geology , or mining equipment? Most of these Argonauts actually envisioned themselves prying thousands of dollars worth of placer nuggets from cracks and crevices using their penknives (which the earliest arrivals actually did at certain locations). Others saw themselves simply walking to and fro plucking bushels of nuggets and loose gold from the ground where it was obviously scattered about awaiting their arrival. The reality, of course, was far less tolerant regarding their golden dreams. "I Fear I Will Starve to Death"
After all the hardships, travail, and loneliness they had endured some arrived at places like Hangtown, Rough and Ready, Goodyear’s Bar, or Angel’s Camp dead broke, exhausted, sick, or half starved. Those that could scrounge a shovel and gold pan worked like dogs, just trying to eke out the barest of subsistence living. There’ll be more to come in my next post. Good luck until then. "Remember, we mine because we love mining, not because we expect to become wealthy robber barons. Keep your perspective and keep your cool. It’ll all “wash out” in the end…"
I especially liked that part. Nice article, I've retweeted it on Twitter. Thank you Mr. Dan. I appreciate your comments and the "tweets." J.R.